DataLore may stir in you a newfound respect for the Spotlight. The stock interface to Spotlight’s index of your hard drive is very simple, but not particularly flexible. DataLore aims to improve the speed and relevance of your search results by permitting you to be very specific about which folders are searched and which are ignored. Excluding your user account’s Library folder, for example, will skip over thousands of files that most users never interact with and shave a few seconds off your search time. DataLore also offers a few tricks for easily narrowing your results. Type “>1y” in your query and DataLore will only look for items that are more than one year old—a feat that requires three or more clicks when searching from the Finder. 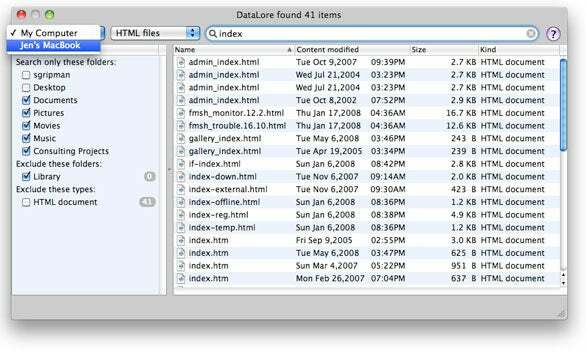 And, unlike the rigid Finder that will only display a file’s last opened date in the search results, DataLore can display the last opened, last modified or creation date. DataLore’s standout feature is searching other Macs on your local network with minimal fuss. While this is possible using the Finder, DataLore’s method is so much faster one wonders why Apple’s implementation is so pokey. The lack of a system-wide keyboard shortcut like Spotlight’s familiar command-space is a puzzling omission in DataLore. The whole point of speedy search results is diminished by the necessity to switch to the DataLore application to invoke a search. Despite this and a pedestrian user interface, DataLore is well worth a try.